The European Roulette Wheel features 37 pockets ranging from 0 to 36. These numbers can be either red or black. The only exception to the rule is the 0 pocket, which is green. 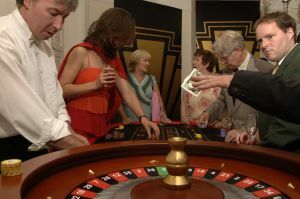 When playing on a single-zero roulette, players have to predict the positioning of the ball before the wheel becomes motionless. Courtesy of the simple rules and regulations, players can easily bet on a certain number, a combination of numbers, colors (red/black) or even/odd outcome. The odds for the ball to land on a winning number are higher as compared to American Roulette, which has more pockets (00-0-37). You can place inside and outside bets on the Roulette table. The latter one enables maximum and minimum table limits according to which you can make choice. Pay attention to the wheel, once it is spun, you aren't allowed to change bets. Inside bets are directly linked with the minimum table amount. They grant different choices for players. Straight up bets imply placing a bet on a single number; payouts 35 to 1. Split bets imply placing bets on two successive pockets or squares; payoffs 17 to 1. Street bets require to place bets on a certain row of three numbers; payoffs 11 to 1. Line bets represent two street bets, betting on 6 numbers will grant a payoff of 5 to 1. Corner bets require to bet on 4 successive squares; payoffs 8 to 1. The outside betting area has no place for the zero. Zero is characteristic for the inside bet square. Outside bets are directly linked with the minimum betting amount. In other words, they total the minimum betting amount. Dozen bets comprise 3 squares; possible combinations can range from 1 to 12, from 13 to 24 or from 25 to 36. Bigger chances, smaller payoffs: 2 to 1. High and low bets engulf 2 squares from the bottom half. Possible numbers: 1 to 18 or 19 to 35. The smallest possible payout: 1 to 1. Odd and even bets are similar to color bets: you have to predict the number or the color. If they fail to avoid the 0, the imprisoned money will be lost. In a contrary situation the bet is recovered without any payout. Players lose half of their bet and cannot keep it in prison for the next spin.